Review 10 Dec 2015. By Kate Sutton. In 2009, the American soap star Victoria Rowell showed up to the Emmys in a dress boldly patterned with a portrait of US president Barack Obama, which bloggers were quick to declare ‘Obamanable’. What the fashion police might have missed is that commemorative cloth like the one Rowell wore serves a specific function within West African culture, where such portrait prints might be commissioned to honour special occasions such as weddings or anniversaries, or to advertise social organizations or political candidates. The images are transferred onto cloth through a wax-print technique, originally imported by Dutch traders, who in turn picked it up in Indonesia. While now identified with West Africa, these textiles are, in fact, an emblem of one culture’s ability to absorb the traditions of others. 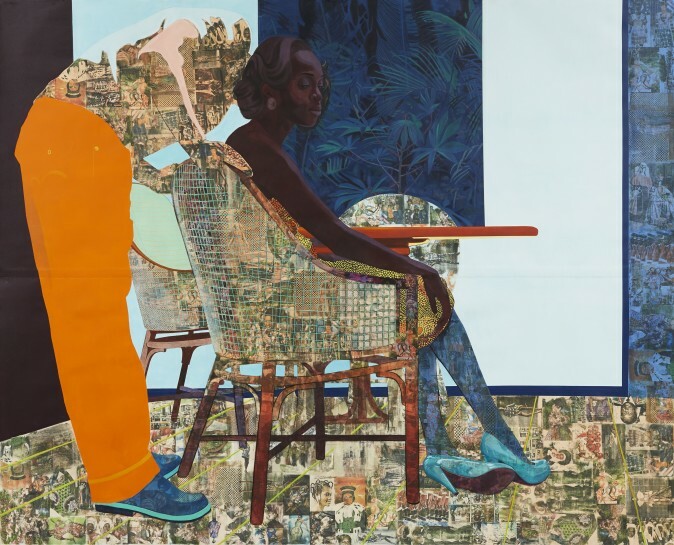 Njideka Akunyili Crosby, who left Nigeria aged 16 to move to the US, traces the seams of this kind of cultural syncretism, through large-scale, mixed-media works on paper that patchwork different modes and techniques of representation to forge a continuity between her experiences in both countries. The artist suspends her domestic interior scenes between continents, depicting family and loved ones trading casual intimacies over the kitchen table or slouched on couches. The quotidian character of their activity is reinforced by flatly applied acrylics, whose lustre is lost to the absorbency of the paper. This same absorbency enables Akunyili Crosby to cover wide swathes of each composition with acetone transfers of photographs, both personal and plucked from society pages and political coverage, She fits the images up against one another like tiles, providing a primer on the visual syntax of Nigerian life. This new form of commemorative cloth flows over from the confines of the figures’ clothing, seeping into the furniture, carpets, walls and even skin.